Many of these events happen in the workplace, and I would so love to write about what’s going on at my workplace these days. But I can’t. It’s possible that some of my coworkers – maybe even The Boss – might come across this blog, and … I. Really. Need. This. Job. Right. Now. ♦ It was a quiet Sunday, and I was doing errands late in the afternoon. Traffic was light just before dinner time. Driving north on 6-lane Niagara Falls Boulevard, I was approaching a light and noticed an ambulance with lights flashing entering the intersection from the street on the left. I pulled over and stopped. The young man behind me didn’t. With horn blaring, middle finger extended, and shouting at the obviously senile old lady, the young driver passed me on the left, never once glancing in the direction of the oncoming ambulance. In the passenger seat was a young woman, and the look on her face was priceless because she did see the ambulance. Fortunately for all involved (and for whatever patient was waiting for emergency care), the ambulance driver was alert and managed to avoid what appeared to be an inevitable collision. ♦ Many years go, we were moving from one rental unit into another. We were paying by the hour for the movers, and they were sympathetic to our somewhat depressed economic situation and not taking any extra time (heck, they knew we were moving from one crappy apartment to another!). We had unscrewed the legs to our build-your-own end tables to facilitate easier transport. As the last boxes were being loaded onto the moving truck, I noticed a table leg in the corner of the living room, picked it up, and threw it into the nearest box. Once in our new home, I discovered we had lost that table leg; we went through every box and couldn’t find it. I called the moving company and asked them to search the truck – no luck there. Ultimately, we had to dispose of the now three-legged table. A number of years later, we finally bought our first home, with room enough for all those miscellaneous items we had previously stored in my in-laws’ basement. I’m sure you’ve guessed it – upon opening one of the stored boxes, we discovered the missing table leg for the table we no longer had. ♦ Which brings to mind the very first move we made after our oldest daughter was born. Again, we had very efficient movers. They came into the house, grabbed everything they saw, and loaded it into the truck. For whatever reason, the only truck available that day was the biggest one they had, with cab-over storage. It was only after the truck pulled away, and the baby started crying for her bottle, that we realized the very first thing that been loaded (by mistake) was the diaper bag which contained all the formula bottles, and it had been loaded into the cab-over area. There was no way to get to that bag without unloading everything else. We asked, but the movers understandably refused to unload – and reload – all the heavy furniture, even if we could have paid for the extra man-hours, which we couldn’t. Needless to say, it was not a fun drive to the new apartment. Every one of us has similar DUH stories. I may share some more of mine in the future. For now, however, I need to run some errands – on Sunday, in the afternoon. I’ll be sure to watch out for speeding ambulances and clueless drivers. This entry was posted in Humor, Road Trips & Cars, That's Life and tagged children, drivers, dumb, family, frustration, moving, silly. Bookmark the permalink. Oh yeah, the DUH moments, or Blonde moments, or in my case CRAFT moments. Yep. We all have them. Seems like I have more DUH moments the older I get. Some of the “dumb” stuff are really “to busy paying attention to something else to notice” stuff. And that young driver was just plain rude — and oh, yeah, driving illegally. Pity there’s never a squad car around when you need one. You’re lucky you only misplaced a table leg of no great value. We had some things misplaces FOR us … the extensions for our handmade oak dining table (no, you can’t replace them … they are made from the same piece of wood as as table and nothing else fits) … the rug cleaning machine … vacuum cleaner … and they dropped my grand piano. Then lied about it. Other than that? NO problems. I will die here. NO one will get me to move again. How awful, Marilyn. Moving is never fun. I sincerely hope my next move will be the last. Oh yes. I have many of those Things We Lost In Our Move stories. Notably, my childhood and heirloom Christmas ornaments. Which is why, the last move, I put everything I considered irreplaceable or too important to lose, in the back of my van with my pets. Oh yes ma’am, I did. Ha, ha. On my way to closing once, I got behind a very slow, older driver. Sitting on his tail for several blocks annoyed both of us so I eventually just passed him. When I got to the closing, the older gentleman across the table from me was complaining about the impatient younger driver tailgating him down that particular street and then being passed by the rude ignoramus. Yup. Fortunately, he hadn’t seen my face as I passed. I just nodded and commiserated with him. HAHA! Oh my word! 😀 That’s a great story! Oh, it’s a little too fresh to laugh yet about all the things I “lost in the move”! Much of it * might* yet resurface, but what’s left is in Detroit, and I’m in St. Paul – can you say “logistics challenge from the dark side”? Every move is an adventure, right, Karen? 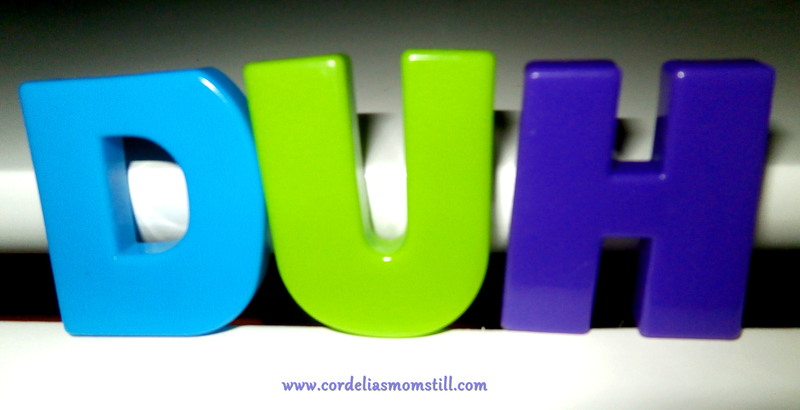 Those “duh” moments are part of life, how we learn and what makes things so interesting. It’s been happening to my comments a lot. This one went there, too! You’d think WP would realize my now that you’re not a spammer seeing as I’ve approved a number of your comments. Before responding to your comment, I just had to go over and check out your post for today. Apparently, great blogger minds think alike! I’m always amazed at the stuff I see on the road. I don’t know if it’s stupidity or arrogance, but it does make for entertaining stories (assuming no one gets hurt). I am always amazed that more people don’t get hurt.